Lately, I feel a bit like a traveling chef! I have spent 2 weeks in Florida and now I am in Atlanta to do some babysitting. Actually kid sitting…my grandsons are 6 and 9. I baked the Orange Almond Tart in the lovely kitchen of the beach house we were staying in. Although the kitchen was not equipped with a food processor, it was a successful venture! Last week, I missed making the green beans because we were quite busy and were eating out a bit more. After all, it was vacation! So this week, I didn't want to miss the Short Ribs. I was concerned that my grandsons would not eat these ribs because of the wine addition. Boy, was I wrong. My older grandson C. ate 3 ribs and loved them so much he asked me to give his mom and dad the recipe. His brother R. also really liked them. He ate one, but he is only six. The funny thing is that I served them with mashed potatoes and peas because I wanted the dinner to be somewhat kid friendly. They ate the ribs but not the potatoes or the peas. Well not the cooked peas. The 6 year old ate his peas frozen. He likes them that way. The nine year old ate raw carrots. I'm just happy they enjoyed the ribs. The boys and their grandfather decided these were keepers and rated them a 10!! I had a somewhat difficult time finding the ribs, so when I was in the grocery store, I asked the butcher to cut them for me. He was very accommodating. He cut them just as I requested. I picked up all the ingredients and the next morning I started the Ribs. You really need a lot of time to make this meal. The prep is pretty involved. First you have to broil the ribs, then chop all the vegetables. Start by heating oil in dutch oven and adding the veggies and cooking till soft and just starting to brown. Then add the tomato paste and cook a few more minutes before adding the bottle of wine, the port and bouquet garni. At this point the kitchen smells incredible! Reduce the liquid, then add ribs to the pot along with the beef broth. This is where it gets easy. Put the pot, covered with aluminum foil, and the lid in the oven and do not disturb for 2 hours. Then remove the lid, loosen the foil and let cook for another hour. Since I was serving this for dinner, I let them sit out for about an hour on the baking sheet and strained my sauce. My grandson had baseball practice last night and they got home late so I actually held up dinner a bit longer. In the end, it all came together beautifully. The only thing I didn't do was make the gremolata. You have to know your audience, and mine was eating frozen peas and didn't like the mashed potatoes. They certainly weren't going to eat the gremolata!! This Recipe can be found in Dorie Greenspans new book "Around My French Table". The ribs after being broiled. Wine and port added. Since I had no cheesecloth in the house I put the herbs in the pot and fished them out in the end. Sauce reduced and ready for ribs and broth. Everything covered and in oven for two hours. Our dinner minus the frozen peas and raw carrots…delish!! Your ribs in the first photo look so good, and I can't tell you how jealous as to how well your glazed photographed in the last one! I'm glad your grandsons enjoyed it! Hi Kathy-Would I love to have a plate of your amazing and delicious ribs, cooked in all that goodness of red wine, and port, mashed potatoes on the side...I even love the peas. such a wonderful job you did on this. Dorie will be so proud of you. I hope you let her see your masterpiece! Great photos, Kathy! I'm so glad your grand sons enjoyed them. Good step by step photos. Great post, Kathy! Funny, some of our shots look almost the same, but I didn't post all of my prep shots. I also just put the herbs in - since everything was going to be strained at the end, anyway, I thought wrapping them in cheesecloth was just an extra, unnecessary step. This was definitely an all-day event in our house! It looks like you managed to keep your Dutch oven much cleaner than I did. I like your new header on your site! My kids loved this meal. Sometimes I don't think we kids kids enough credit for being able to eat things other than nuggets and mac n' cheese, but my kids are always surprising me. This was one of my favorite recipes so far! I love that your grandsons eat frozen peas and raw carrots :). So cute! We loved this dish too at our house. Nice step-by-step photos! The mental picture of your grandson eating frozen peas made me giggle. Your photos are lovely - enjoyed them all but now I want that full plate for myself (gorgeous and yummy). 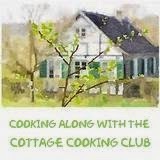 I am so impressed you juggled all these recipes while traveling and visiting- kudos to you. Love the reactions from the family -esp the little ones. Nana and I loved this dish- another winner in our books. Wonderful photos! Sounds like you've had several very adventurous weeks. It's great that you've been able to share your French Fridays recipes with your family. I was doubtful as well about how the kids would react to them but they loved them as well! Sounds like you're having a very fun and busy time! Your photos look great!! Wow your ribs look great! I love your pictures! The meal looks so hearty and tasty!! Im glad you enjoyed! Your photos look terrific...your ribs look great...not too dark at all! I'm so glad the boys enjoyed them. Too funny about the frozen peas. I made the gremolata and then promptly forgot it in the fridge. Never did try it. Oh well. PS...love the drawing at the top of your blog. Is it new or have I just missed it before? BTW, LOVE your King's cake! Hi Kathy, First time to visit your blog. Your dish looks so tasty. I love that you served the peas and mashed potatoes. There's nothing like peas with some mashed potatoes all tied together with the most wonderful gravy! Now think of that "perfect bite" you always see on the Food Network!